The Xbox 360 is the second video game console produced by Microsoft, and was developed in cooperation with IBM, ATI, and SiS. The integrated Xbox Live service allows players to compete online and download content such as arcade games, game demos, trailers, TV shows, and movies. The Xbox 360 is the successor to the Xbox, and competes with Sony's PlayStation 3 and Nintendo's Wii as part of the seventh generation of video game consoles. 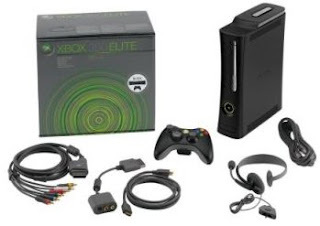 The Xbox 360 Elite is the fourth and variation of the console. It includes a 120 GB hard drive and a matte black finish. The console is equipped with a premium black finish and an HDMI port and like all Xbox 360 systems, comes with three powerful core processors, 16:9 cinematic aspect ratio, anti-aliasing for smooth textures, full surround sound, HDMI cable and DVD playback with upscaling capabilities right out of the box.